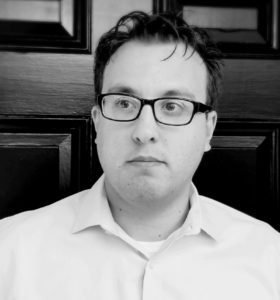 I am an Assistant Professor of Political Science at California State University, San Bernardino specializing in comparative politics and international political economy with a regional focus on Latin America. My research explores two central topics within comparative politics and political economy: the politics of social policy under globalization and the role of legislatures in shaping major economic reforms. My current book project, entitled Social Policy in the Era of Globalization: Ideology and Models of Cash Transfer Programs in Latin America, studies how presidential ideology influences the adoption and design of social policy in that region. Combining quantitative analyses covering the entire region and case studies on Brazil, Argentina, Bolivia, and Costa Rica based largely on field research, I examine the relationship between two of the most significant transformations in Latin American politics during the 2000s: the widespread election of left-leaning presidents and the diffusion of conditional cash transfer (CCT) programs. Described as the most important innovation in social policy of the last fifteen years, CCTs relieve poverty by awarding families regular stipends conditional on their children attending school. An article-length version of the book’s argument was published in Comparative Politics in early 2018. My work has also been published in Government and Opposition, Latin American Politics and Society, International Studies Perspectives, and Revista de Ciencia Política. I hold a Ph.D. in Political Science from the University of Southern California (2015) and an M.A. in Latin American Studies from Georgetown University (2008). Originally from San José, Costa Rica, I worked for five years (2002-2006) as a politics and business reporter there covering presidential cabinet meetings and the negotiation and implementation of the Central American Free-Trade Agreement, among other topics. 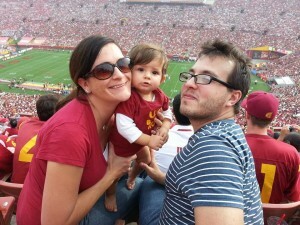 My family and I at a USC football game at the Los Angeles Coliseum.